DAVAO CITY- Human rights group Karapatan-SMR said that the DSWD and police investigation against support groups facilitating the evacuation of over 700 lumads in UCCP Haran should be directed instead to members of the police force operating under the orders of Rep. Nancy Catamco last July 23. “Catamco made it clear that she was going to bring the IP’s back to their homes, whether they liked it or not. She even welcomed the idea of having to use force. Such is a manifestation of initial attempt to traffic the lumads out of Haran, when clearly such scenario is against their will,” said Hanimay Suazo, secretary-general of Karapatan-SMR. “These agencies wanting to investigate the support groups are wasting taxpayers’ money in doing so. But then again, what can we expect from this government?” Suazo asked. Suazo said that the DCPO and suspected intelligence agents under it were the “hands that did the dirty work” in the attempt to traffic lumads out of their evacuation site. “Let us not delude ourselves. Footage of the incident clearly shows that the police hurt the evacuees who stood their ground, after an unidentified man cut off the locks of the gate in UCCP Haran. That was the first step to bringing the lumads out against their will,” Suazo added. Suazo reiterated that some DSWD personnel have been to the evacuation camp only to do some surveys for reports that till now are unknown. 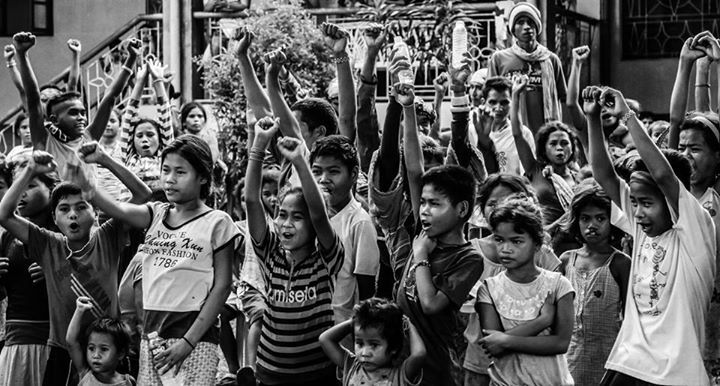 “Even few minutes before the violent dispersal last July 23, DSWD representatives were there for a dialogue. 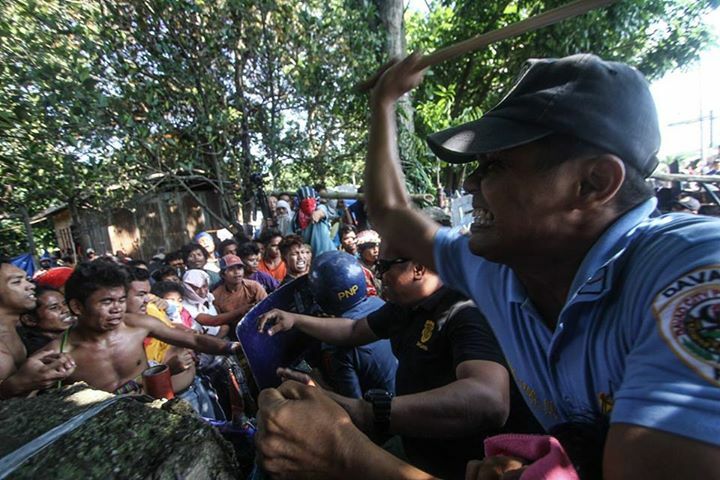 According even to the PNP, the order to disperse the camp was coming from DSWD,” she said. DAVAO CITY- After the violent and illegal police assault against the 700 lumad evacuees in UCCP Haran last July 23, lumad leaders are quick to ask for the response of government agencies regarding the matter. Datu Doloman Dawsay, spokesperson of the Talaingod Manobo organization Salugpungan Ta Tanu Igkanugon, says that the CHR should set its sights on the police brutality under Nancy Catamco’s manipulation. Dawsay added that the CHR should do its tasks, and stop being inutile. “Kani, nahitabo na jud sa ilang tugkaran, siyaro di pa jud nila atimanon. Buhaton na jud unta nila ilang trabaho, undangon na nila ilang pagka-walay pulos” (“This happened in their own backyard, it would be unseemly if they don’t take action about it. They should do their job, they should stop being useless”). Lumad leader Bai Bibyaon Bigkay shared Doloman’s sentiment. “Kung dili mi matabangan sa CHR, pasabot lang jud ana dapig sila kay Nancy Catamco, batok sila sa mga susama namong mga lumad” (“If CHR cannot help us, it only means that they are siding with Nancy Catamco, they are against us lumads”). Karapatan-SMR secretary-general Hanimay Suazo echoed the calls of the lumad leaders, saying that CHR “should get dirty in the real world”. Suazo added that CHR must bridge the gap between itself and human rights victims, if they are to do their job. We are reposting the official statement of the UCCP SEMJA regarding the violent police assault by elements of the PNP 11 under the San Pedro Police Station, commanded by Col. Marvin Pepino and Supt. Lao. Despite the pleas of UCCP pastors for the police to leave, they destroyed the gate of the UCCP compound, and beat up the lumad leaders and members of support groups who stood their ground. Over 700 lumad evacuees had to evacuate from their evacuation zone. 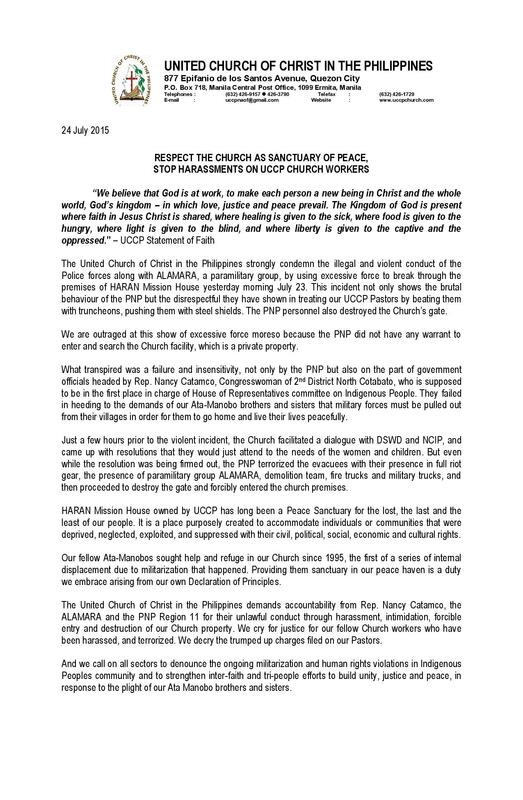 The United Church of Christ in the Philippines strongly condemn the illegal and violent conduct of the Police forces along with ALAMARA, a paramilitary group, by using excessive force to break through the premises of HARAN Mission House yesterday morning July 23. This incident not only shows the brutal behaviour of the PNP but the disrespectful they have shown in treating our UCCP Pastors by beating them with truncheons, pushing them with steel shields. The PNP personnel also destroyed the Church’s gate. We are outraged at this show of excessive force more so because the PNP did not have any warrant to enter and search the Church facility, which is a private property. What transpired was a failure and insensitivity, not only by the PNP but also on the part of government officials headed by Rep. Nancy Catamco, Congresswoman of 2nd District North Cotabato, who is supposed to be in the first place in charge of House of Representatives committee on Indigenous People. They failed in heeding to the demands of our Ata-Manobo brothers and sisters that military forces must be pulled out from their villages in order for them to go home and live their lives peacefully. Just a few hours prior to the violent incident, the Church facilitated a dialogue with DSWD and NCIP, and came up with resolutions that they would just attend to the needs of the women and children. But even while the resolution was being firmed out, the PNP terrorized the evacuees with their presence in full riot gear, the presence of paramilitary group ALAMARA, demolition team, fire trucks and military trucks, and then proceeded to destroy the gate and forcibly entered the church premises. HARAN Mission House owned by UCCP has long been a Peace Sanctuary for the lost, the last and the least of our people. It is a place purposely created to accommodate individuals or communities that were deprived, neglected, exploited, and suppressed with their civil, political, social, economic and cultural rights. Our fellow Ata-Manobos sought help and refuge in our Church since 1995, the first of a series of internal displacement due to militarization that happened. Providing them sanctuary in our peace haven is a duty we embrace arising from our own Declaration of Principles. The United Church of Christ in the Philippines demands accountability from Rep. Nancy Catamco, the ALAMARA and the PNP Region 11 for their unlawful conduct through harassment, intimidation, forcible entry and destruction of our Church property. We cry for justice for our fellow Church workers who have been harassed, and terrorized. We decry the trumped up charges filed on our Pastors. And we call on all sectors to denounce the ongoing militarization and human rights violations in Indigenous Peoples community and to strengthen inter-faith and tri-people efforts to build unity, justice and peace, in response to the plight of our Ata Manobo brothers and sisters. DAVAO CITY- Human rights group Karapatan-Southern Mindanao Region decried today the promotion of Maj.Gen. Eduardo Año as chief of the Philippine Army. 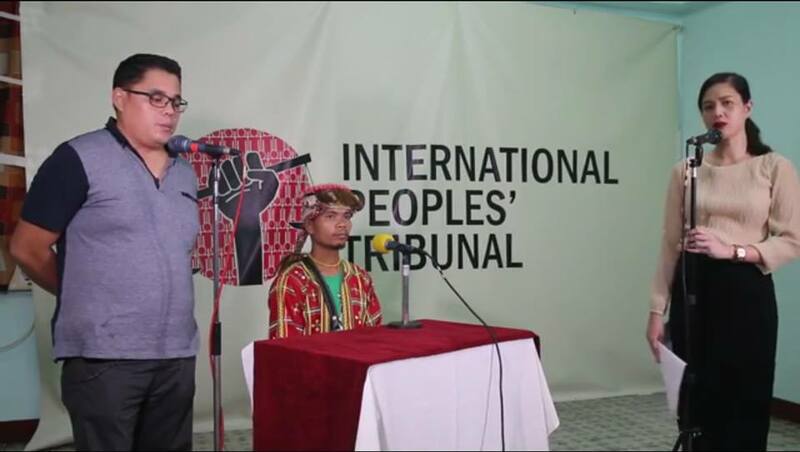 “The 10th ID, under the leadership of Año, was at the frontlines in the war against peasants, lumads, and human rights defenders,” said Hanimay Suazo, secretary-general of Karapatan-SMR. Forcible evacuation of lumads and farmers, trumped-up charges against leaders of progressive organizations, illegal arrests of civilians perceived enemies of the state, and killings of helpless civilians. This was the result of Año holding the helm of the 10th ID here in Southern Mindanao. 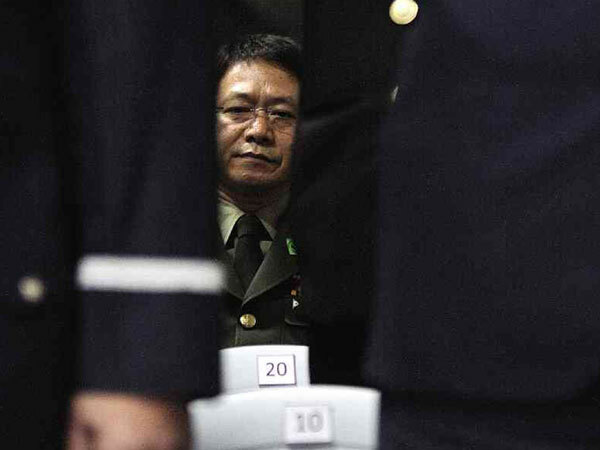 “If Año can bring that kind of terror in the region with the limits as a division chief of the army, what is it to stop him from wreaking havoc on a national level?,” Suazo asked. Under Año, the killing of three civilians in the Paquibato Massacre and vilification of lumad leader Aida Seisa as member of the New Peoples Army (NPA) took headlines last month. This was followed by a strafing incident of Compostela Farmers Association (CFA) chairperson Bello Tindasan, the killing of community leader and Typhoon Pablo survivor Felix Basig in Davao Oriental, and many other countless rights violations. The closure of lumad schools in Talaingod and Kapalong through the collusion of the military and DepEd XI was also an issue in the previous months. Suazo pointed out that the attack by suspected state agents to the office of Karapatan-SMR and the victims taking refuge in the area was perpetrated while Año was the chief of the 10th ID. Under his term as 10th ID chief, Año boasted the killing of of top NPA leader Leoncio “Ka Parago” Pitao and his medic Vanessa “Ka Kyle” Limpag. This, many believed, catalyzed his promotion. Third-party groups to the armed conflict have been quick to condemn the killing of Pitao and Limpag, as the former was already in hors de combat status, while the latter’s right to life have been guaranteed under the International Humanitarian Law. It was only less than a year ago when Año was appointed as commanding officer of 10th ID, side-by-side with another Palparan-trained general Aurelio Baladad, who became chief of the Eastern Mindanao Command. These two notorious generals reactivated the low intensity conflict-style in Mindanao through the re-formation of paramilitary groups like ALAMARA and BAGANI Force. Citing the plight of the 600 Manobos who have taken sanctuary in Davao City to escape militarization, Suazo said that the terror spread out by the military will intensify even more. DAVAO CITY- Human rights group Karapatan-SMR raised the human rights violations perpetrated by state elements under the US-Aquino regime in the International People’s Tribunal (IPT) to be held in Washington, D.C., from July 16-18. 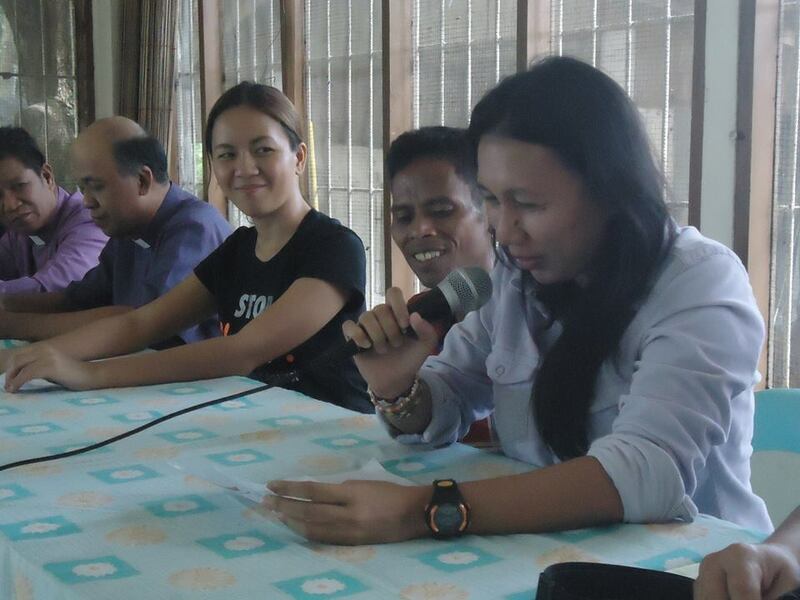 Three participants from Southern Mindanao are due to highlight the issues in the region. Tungig Mansimuy-at, a lumad leader from Talaingod, is set to narrate the experiences of over 700 Manobos from Davao del Norte and Bukidnon. Ariel Casilao, leader of progressive labor group Kilusang Mayo Uno (KMU), will present the human rights abuses against the labor sector in Southern Mindanao. Ronnie Garcia, administrator of the Salugpungan Ta Tanu Igkanugon Community Learning Center, an indigenous-peoples school, will show the state attacks against IP learning centers in the region. DAVAO CITY- Progressive groups slammed the trumped-up charges filed by the CIDG against leaders of progressive organizations involved in the evacuation of hundreds of lumads from Talaingod. On May 12,2015 formal complaints were filed at the Davao City Prosecutor’s Office against 15 leaders from different progressive organizations who were involved in the issue of evacuation of lumads in the region. All of them were accused of kidnapping and serious illegal detention, and human trafficking of lumad evacuees to Davao City. Included in the list of accused are: Hanimay Suazo, secretary-general of KARAPATAN-SMR; Rev. Jurie Jaime of the Promotion of Church People’s Response (PCPR)-SMR; Sheena Duazo of BAYAN-SMR; Ryan Lariba of BAYAN-Socsksargen; Tony Salubre of the Kilusang Magbubukid ng Pilipinas-SMR; Mary Ann Sapar of Gabriela-SMR; Jaja Necosia of RCPA Productions-Broadcasting; Kerlan Fanagel, secretary general of the Lumad group PASAKA; Sr. Stella Matutina of PANALIPDAN-Mindanao; Isidro Indao, spokesperson of PASAKA; Kharlo Manano, national secretary general of SALINLAHI Alliance for Children’s Concerns and spokesperson of the Save Our Schools network; Rius Valle of the Children’s Rehabilitation Center-SMR; Jimboy Marciano of SAMA-AKO-KMU, Pedro Arnado, chairperson of Kilusang Magbubkid ng Pilipinas-SMR, along with John Does. The complainants are Criminal Investigation and Detection Group (CIDG XI), Angkomog brothers, ALAMARA paramilitary group, backed-up by Nestor Apas, known racketeer and collaborator of the AFP, and 68th IB-10th ID-Eastern Mindanao Command of the AFP. Hanimay Suazo of Karapatan-SMR immediately brushed off the trumped-up charges, saying that these were all concoctions to hinder their work and meant to intimidate the human rights defenders. Suazo said that the filing of trumped-up charges has become a common occurrence. Kailo Buntolan, member of the Salugupungan, said that they were not harmed by the progressive groups in the course of the evacuation. “Wala man mi nila gipasakitan. Unsa man ni sila, military? Sila pa gani ang nasakitan, kay sila ang mainitan sa pag-luto sa amo pagkaon” (“They did not hurt us. Why would they hurt us, just are they, the military? They are the ones who get hurt, because they get burns from cooking our food”), Buntolan said. Asked for what their next steps would be, Suazo said that they will not stop in advancing and defending human rights and determined to pursue justice. “We will SLAPP back and we will fight for justice,” Suazo ended. DAVAO CITY- The sole survivor of the Paquibato Massacre last June 14 continued to assert the civilian status of her slain neighbors and of her daughter, during the third session of the hearing by the city council regarding the incident. “Nanay Cita”, mother of Aida Seisa, who survived the shooting spree by the elements of the 69th IB, said that she will persist to file charges against the military. “Musampa jud mi ug kaso Sir, kay sibilyang dako jud ning ako mga silingan. Kaning akong anak, mao ra pud ni ang mutabang sa mga gipang-abuso sa military, dili na siya NPA” (“We will certainly file a case (against the military), because my neighbors were really civilians. My daughter, she’s the one who helps those who have been abused by the military, she is not an NPA”), said Cita to Coun. Bello. Coun. Bello brought up the issue of how civilians in conflict areas are perceived, particularly those bearing progressive ideas or having sympathies with armed groups. “Kung ako magpakape sa NPA, NPA na diay dayon ko?,” Bello asked during the hearing. Hanimay Suazo, secretary-general of Karapatan-SMR, said that they are determined to attain justice for the victims of the Paquibato Massacre.